Over the years, a number of earthquakes shook her 40ft foundation while the Empire pillaged much of her facade for the construction of other buildings, including St. Peter's Basilica. The once towering symbol of grandeur was stripped of her unique travertine and even of the iron pegs that fastened her aesthetic outer garment of brilliant marble. 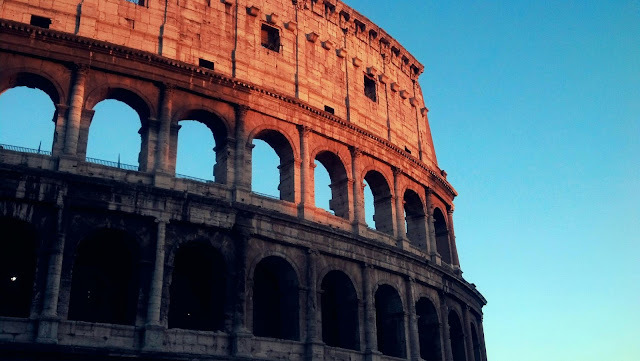 Left exposed, the Colosseum was finally taken pity on by the Catholic Church who offered her asylum and began to take steps toward her continued protection. Though it has now been illegal to remove stones from the Colosseum for over 250 years, she has continued to fall further into disrepair. As I face this ruin, once a giant in every sense of the word, it is difficult to see past the dark rust color that has now overwhelmed her. Worn down by the sheer pressure of time, coated constantly by pollution from droves of traffic each day and shaken weaker by the vibrations of the aforementioned auto traffic - it doesn't seem likely that future generations will see more of her than a photograph in a textbook. This evening irony has struck me - as I sat at dawn, just today, sadly pondering the fate of Rome's great architectural legacy. 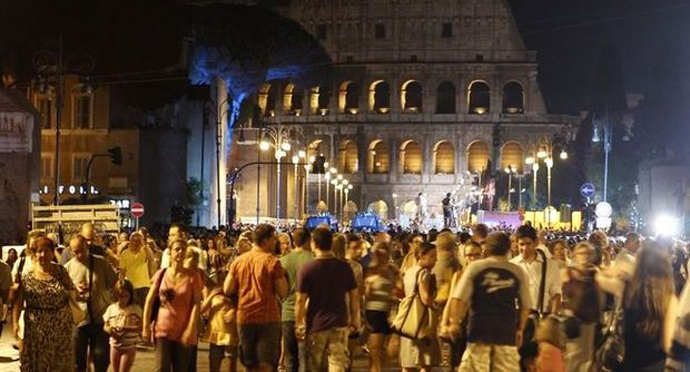 Upon our return from yet another delectable "breakfast" at L'archetto, we are overwhelmed by the celebration and crowds gathered along the main road near the Colosseum. As it turns out, we are present for an enormous shift in the history of The Eternal City. I am surprised, and amply satisfied at the cause for the closing (to auto traffic, that is) of this main artery through Rome! Though this route will again open up to city buses and taxis tomorrow, it will permanently be closed to private traffic. This move will reduce auto traffic by a whopping 90%, and is being made in an attempt to lessen vibrations & pollution felt by the Colosseum. The Mayor of Rome says he would like to see a complete pedestrianization of the Flavian Amphitheater and Forum areas by the end of his term. Kudos to you, Mr. Marino! As far as this particular evening is concerned, it is simply a giant Italian party to celebrate the kickoff of this incredible project. As Wilhelm and I approach the area by foot we can see acrobats performing, the brightly lit Colosseum and a rich navy colored sky acting as the ultimate backdrop. We join the crowds of excited locals and tourists alike, strolling along a path meant solely for auto travel since 1924 when the fascist dictator Mussolini put the route in for easier access to his offices. Under the new changes, some of these major roads may even be declared archaeological sites and be dug up for new explorations. A beautiful Italian voice finishes a ballot of which we can feel the emotion though we cannot understand the words. As we move past the stage amongst the masses, in the distance we can hear the drifting words of John Lennon, "they may say that I'm a dreamer...but I'm not the only one...". It is a poignant and stunning moment to experience with the international people of his brilliant city, and I think I have the best seat in the house - hoisted high above the happenings, upon my husband's shoulders. Walking home on what was once a route making the great Colosseum little more than a traffic island, singing with people of the world in celebration of this urban rebirth of Rome - this is an unexpected experience we will not soon forget. DISCLAIMER: You should know before continuing that I dig history. I love facts... (I tell Wilhelm they are "funfacts", though sometimes I'm sure this is an overly generous term for them). If you know me, you know I hate (okay..."strongly dislike". Hate is an ugly word) school. I very strongly dislike school. But. I love to learn. So, you've been warned. If you wouldn't find it, at a very minimum, fascinating to cop a squat about the grounds of Rome, sit back and take in not only the remarkable sights but the rich history of such a place...well then, you may want to sign off now. During her horrifying hay day, this structure was not only a relevant source of entertainment, but it made major political statements as well. The Colosseum was built upon the grounds of the golden estate of Nero (known to have been tyrannical and cruel - example: ordering his own mother's execution and burning early Christians in his garden for light). By building a site that would (in theory) advantage the people on this exact spot, Vespasian made a grand gesture of compassion and empathy to his citizens. I do find it fascinating that the Colosseum games were always free through the Emperor or "free" as a bribe from crafty (and wealthy) politicians in order to win the peoples' favor. The idea was that the everyday Roman, who's life revolved around the idea of war and conquest, could see first hand the magnanimous power of the Roman Empire through the games. Sadly, using exotic beasts in hunting games and in man on animal battles, Rome's conquest of foreign lands was showcased. Another way in which the Emperor liked to highlight this power was by adding to the games disoriented chieftains captured from so-called "barbaric lands". When it came to man on man fighting, the highlight of these "games" was the match up of two trained gladiators. The people of Rome were often given the opportunity to play God - when a gladiator finally fell to the ground the remaining fighter would wait for word from the Emperor on whether or not the man should live. The Emperor would turn to the masses for a thumbs up, or thumbs down. This faux sense of power ,enabled through the games, proved beneficial for the powers of Rome for some time as the Colosseum served as a source of entertainment and pacification for over 400 years. After the slaughter of approximately 500,000 humans and one million foreign animals, the Colosseum was finally deemed no longer "politically correct" under Emperor Constantine's Christian rule. The structure was temporarily used as housing, markets and churches. It was eventually abandoned completely - sometime after, it is reported that a studying botanist found over 600 species of plants and flowers flourishing in the cracks of the dying structure. These exotic seeds are believed to have made it there by way of the captured animals from across the globe. Sadly, it is also believed that the Colosseum games are to blame for the extinction of many amazing creatures during its years of operation, including the North African Elephant.